← So, where are we going today? 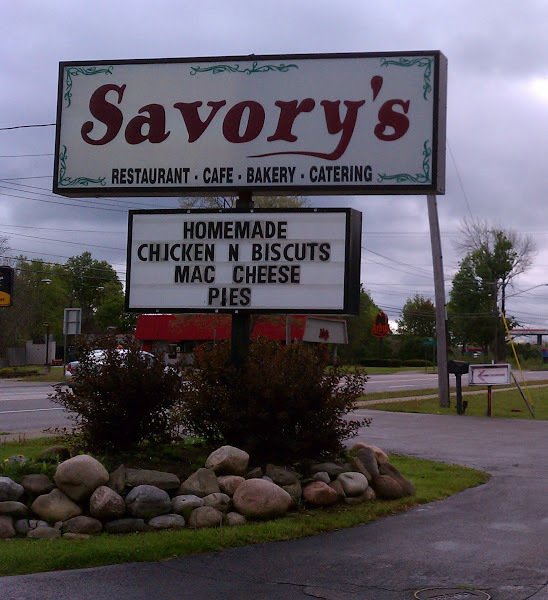 Our journey back to MA continues – on Friday morning, before we left Camping World we went across the street to Savory’s Diner. 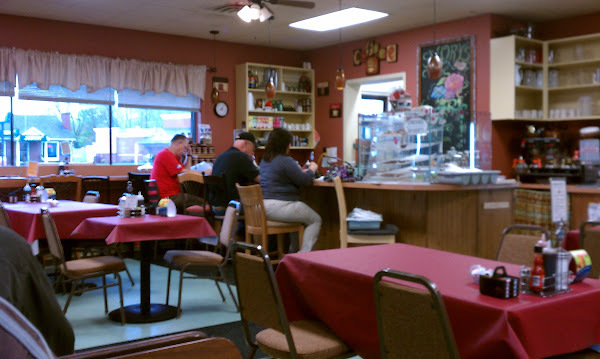 Cute place, good food and good service! 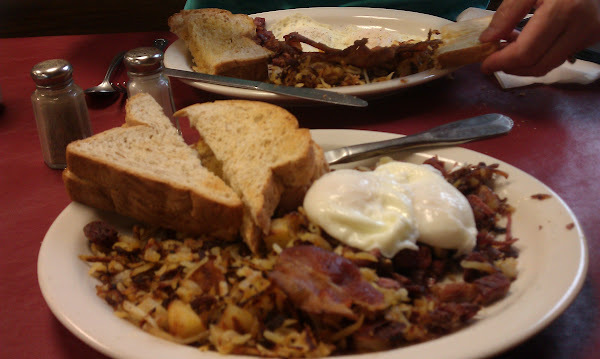 Rob had their home made corned beef hash and I had two eggs, bacon and hash browns. Both came with home made bread. After breakfast we prepared for our departure from Camping World. Before hitching up the toad, Rob maneuvered the coach over to the dump station. Then we hitched up and off we went. 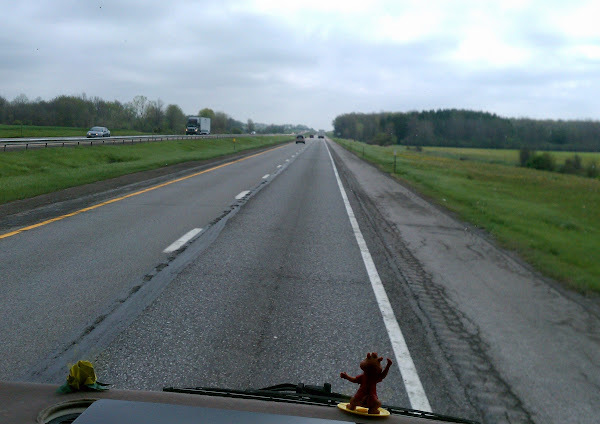 The drive was pretty uneventful – I-90 all the way. In the past we have made several trips from Norton to Chicago and always found I-90 preferable to I-80. The driving is easier we think on the New York Thruway and Mass Pike. Also, to get to New England from I-80 requires passing through congested Hartford, CT or a stint on one of the crappiest sections of I-95 through NY and CT. I-90 is also very scenic. 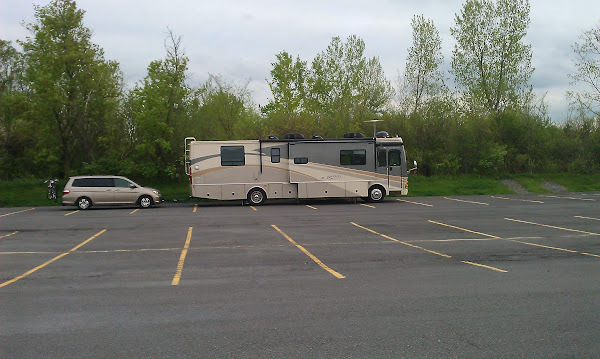 We had decided we would try staying in a WalMart parking lot in Amsterdam, NY about 4-1/2 hours of driving time away. The satellite views showed an expansive parking lot there with some good spots for a long rig. 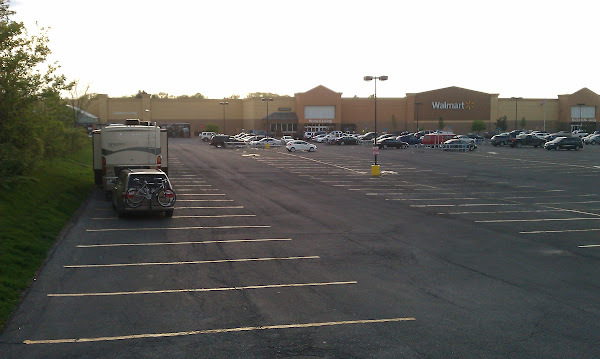 We had checked several lists online that indicated this WalMart allowed overnight parking. So Rob set the GPS (both of ’em) for that destination. As we traveled along, the drive became more scenic and the highway became more hilly. We were between the Adirondacks and the Catskills so we could see the mountains off in the distance. Of course, we had to squint between all the bug splats obscuring the windshield which made taking pictures pretty impossible. At exit 27, we exited I-90. Amsterdam is pretty hilly so it was an interesting few miles to WalMart. The satellite views showed a nice big parking lot with a section near the main drag that looked perfect for staying overnight. Well, it was, but as we pulled in to that section, I noticed signs saying “no truck or RV overnight parking”. Darn, I guess the lists that we consulted were not very up-to-date. Lesson learned – call first to check! Now what? Rob had written down several other WalMarts so he called the next one on the list in Glenmont. Yes, they allowed overnight parking so off we went. We had to go back the way we came and down some very steep hills – it was a little freaky. After going through the particularly narrow EZ Pass toll booth (I still close my eyes when we go through), we got back on I-90. 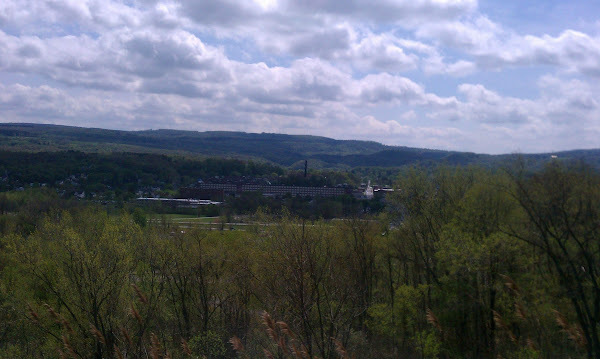 Glenmont was about 50 minutes away off of I-87 (The New York Thruway). 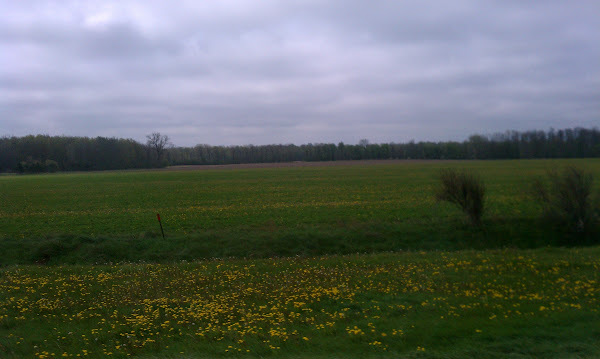 Around 5:00 p.m., we exited and followed the GPS instructions (Mrs. Google and Mrs. Garmin were in agreement for once) to the Glenmont WalMart which was pretty easy. When we arrived in the parking lot, we pulled into the far (south) side against a grassy berm where there were no other vehicles. When Rob called, he was told that we needed to check in with the store manager at the Customer Service desk so we headed into the store. At the desk, they told us we didn’t need to talk to the manager and as long as we parked in the back of the parking lot against the berm, we were fine. And the good news was that there was an Applebee’s next door so that would take care of dinner (made my day). 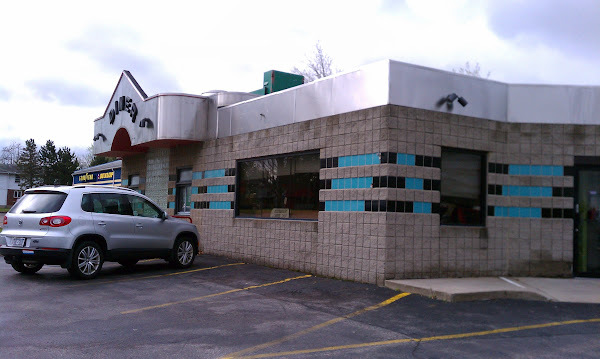 Once we settled in, Rob washed the blood and guts off the windshield, then we walked over to the restaurant where we had the 2 for $20 deal – you get an appetizer and 2 entrees all for $20. We had spinach and artichoke dip as a starter and we both had the Bourbon Blackened Shrimp and Chicken. We’re not big fans of Applebee’s but it was an OK meal. Once we were finished with dinner, we walked back to the coach. I think we were both a little nervous this being our first time staying in a parking lot with no one else around, so neither one of us had a good night’s sleep. Rob thought a good analogy was anchoring on the boat, where a shift in the weather or current can cause the anchor to drag and getting a good nights sleep is difficult for a prudent captain. A mooring instills much more confidence and is always preferred (although, while on a mooring we have been hit by other boats dragging their anchor!). So anyway, anchoring is to Walmart what a mooring is to a nice safe campground. While this Walmart is not open 24 hours, the lights in the parking lot remain on all night so that was comforting. But around 2:00 a.m., we both woke up because someone’s car security system started honking and at first we thought it was our Odyssey but then realized it wasn’t. Then when we tried to get back to sleep, there was this bird (robin?) that was singing a lovely tune all night long right outside our window. Don’t birds sleep at night? And, of course, by now the kitties knew we were awake so they decided they just had to pester us. Good thing we were arriving back in MA on Saturday so we could catch up on our sleep! This night was also interesting to TheVoltDoctor (Rob) because it was our first time truly dry camping. He set the generator up so it would auto start when the battery capacity dropped to a certain point or if the thermostat called for A/C. Turns out our house batteries still have a decent capacity (although not their rated capacity) and the generator never needed to run, even though we had the Inverter/TV’s/Tivo running for several hours. Our LED lighting also kept the drain low. In the morning I ran the generator only briefly so I could use the “dreaded” (TheVoltDoctor’s word, not mine) hairdryer. TheVoltDoctor uses a Xantrex Link battery monitor to track battery capacity on our coach (and boat) and I’m sure he will post about it eventually.